Set on one of Antigua's many beautiful beaches, this exclusive hideaway offers guests a fabulous combination of superior service, gourmet cuisine and rustic luxury in a very natural setting. Much of the architecture here is inspired by the French artist Gauguin. The charming individual cottages with their separate bathroom and splash pool are surrounded by lush gardens. There is a peaceful, natural lagoon which is host to rare birds, pelicans and herons. There are 3 excellent restaurants offering intimate, candlelit dining of excellent quality. At sunset, hors d'oeuvres are served at the Teepee Restaurant, which overlooks the sea from under its Tahitian-style roof. Gauguin cottages offer a spacious accommodation with a small plunge pool but do lack privacy as the bathrooms are not completely private. Beachfront rooms offer a very special setting just steps from the sea and have a more private aspect. 7 ft. by 9 ft. and feature adjacent sundecks concealed by either the tropical vegetation or screens made from natural Spanish heather. showers and extra large bathtubs. Lower level rooms offer access directly on the beach, while the top story rooms offer lofty vaulted ceilings and incredible ocean views. Guests can choose from the best of the island’s local flavours with everything from classic West Indian ‘roti’ to seafood gumbo.Why not begin your evening with a sundowner in our informal oceanfront Teepee Bar? There’s nothing quite like sipping a rum punch and watching the sun slowly sink behind the Caribbean Sea. Or you may prefer cocktails and hors d’oeuvres in our elegant Lounge Bar, the friendly staff and lively rhythms guaranteeing a memorable occasion. For the utmost in relaxation and pampering, we invite guests to explore Indulge, our beautiful new spa, which made its debut in January 2008. Get a great work-out at our spacious, air-conditioned fitness centre complete with Cybex weight stations, treadmill, free weights and stationary bicycle. The fitness centre provides glorious views of Galley Bay’s bird sanctuary lagoon. Galley Bay has a range of amenities for our guests to enjoy. Open air library with board games & comfortable seating - the perfect setting to enjoy a good read! With a beautiful location that's designed with privacy and romance in mind, Galley Bay is the perfect choice for a wedding. 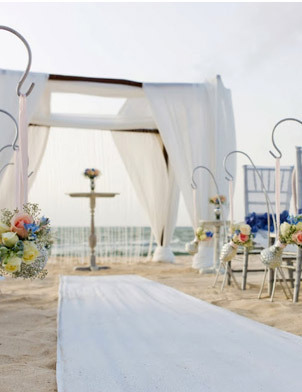 The resort is dedicated to adults (except for Christmas/New Year), and its lovely, rustic beachfront gazebo and spectacular beach and garden settings make for one-of-a-kind weddings that are limited only by your imagination. NB: Taxi transfer to the Registry Office to make the marriage application are not included.